On March 21, a preliminary hearing in the case Public Information and Need of Knowledge NGO vs. The Municipality of Yerevan took place at the Administrative Court of Yerevan; the case concerns the removal of public posters advocating tolerance towards LGBT people. 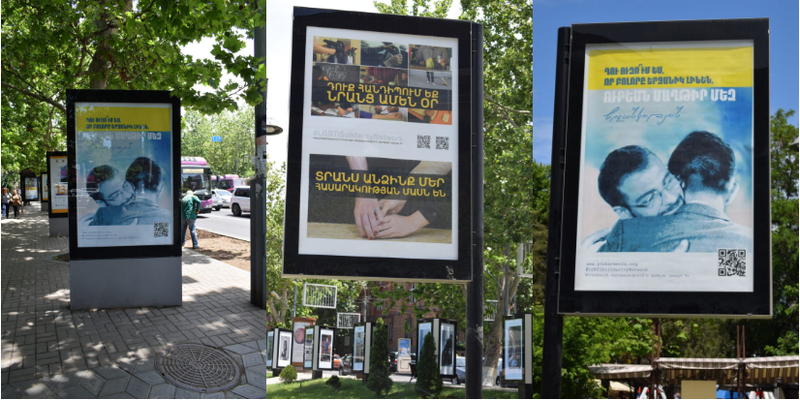 During the hearing the plaintiff filed a motion with the court to call Gayane Arustamyan, the employee from Nushikyan Association LLC responsible for the installation of the posters, as a witness to find out why, upon whose order and on which grounds the posters had been removed, why despite an earlier agreement no request had been filed with the Municipality in order to obtain permission to recover the posters, as well as to find out what the practice before the incident used to be: whether a prior permission used to be required in order to install posters or not. The plaintiff also filed a motion to call Hovhannes Galajyan, Chief Editor of Iravunk newspaper, as a witness for the following post he had made on Facebook, “An important element of waste collection. The Municipality of Yerevan, promptly responding to the residents’ complaints, removed the illegal posters supporting garbage [translation from Armenian],” in order to find out who exactly had submitted the mentioned complaints to the Municipality and what kind of complaints they were. Judge Rafik Khandanyan rejected the motions and set the case for trial.